Traditional 1/2" to 1" white washdown hoses have a standard "black tube" (non-food grade tube) however our NL2254 has a "white FDA approved tube" for use in applications where the washdown water going through the hose must remain of higher potable standards. Its high quality cover resists oil, animal fats, gouging, and abrasion; its cover also contains built in Microban Antimicrobial Product Protection. This hose can be used in a variety of oily or fatty food processing plants, dairies, creameries, canneries, packing houses, bottling plants, breweries, or wineries (not for use with air). Typical Fittings: N400L long Brass Barbs (higher temp/PSI), N511/512 Long shank brass GHT ends, N2280 stainless hose swivels, stainless WC-SS crimp sleeves, N52 punch clamps. For HOT water applications long shank/long barb fittings are required. If using cleaning chemicals or sanitizers, always confirm if they are compatible with the nitrile rubber compounds of this hose. Construction: Tube: Smooth, white FDA approved nitrile synthetic rubber. Cover: Smooth, blue FDA approved Carbryn nitrile synthetic rubber with Microban product protection. Reinforcement: Spiral synthetic yarn. 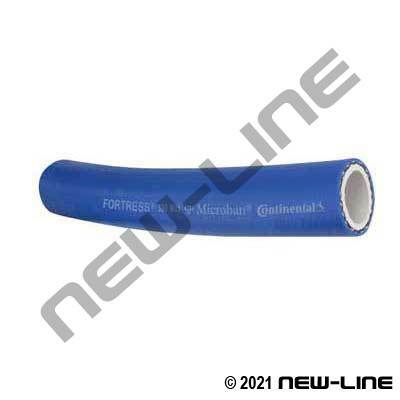 Detail Comments: This hose is made of nitrile rubber compounds (tube and cover) that may not be suitable for use with certain cleaning chemicals, solvents, detergents or sanitizers; such solutions can have an adverse effect on the hose, resulting in reduced service life or failure. Ensure compatibility by referring to the manufacturer chemical resistance chart. Inspect hose before each use.